Supermicro’s latest offering features Intel’s Z87 chipset, 3 PCI-E 3.0 x16 slots and a selection of overclocking features. Overall, a nice board but nothing special except for one little detail: It’s made by Supermicro. Supermicro is a company that has made a strong name for itself in the server market. They have a reputation of making solid and stable products, but not really for designing overclocking boards. Their entry in the consumer market comes at a time when Intel is pulling out of this same market. Supermicro’s bid seems to be replacing Intel by offering no-frills but high-quality products. The C7Z87-OCE is aiming in that direction. 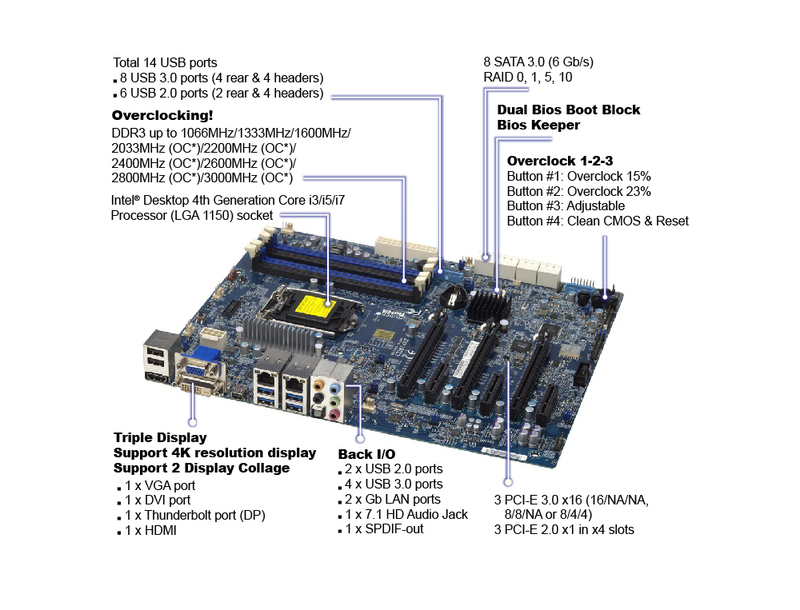 The new motherboard implements Intel’s Z87 chipset and socket 1150 for Haswell processors. It features three PCI-E 3.0 x16 expansion slots for up to three graphics card in x16/0/0, x8/x8/0 or x8/x4/x4 depending on the number of cards installed. In between those are three PCI-E 2.0 x4 slots (x1 electrically). 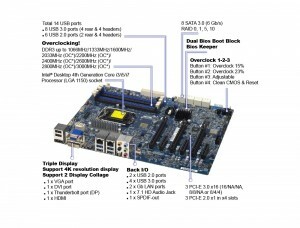 The board offers a total of 14 possible USB ports in the form of eight USB 3.0 (four rear, four headers) and six USB 2.0 (two rear, four headers). A total of eigh SATA3 connectors take care of storage needs, with support for RAID 0, 1, 5 and 10. Supermicro adds an interesting hardware feature aimed at the overclockers in the form of four preset buttons on the lower right corner of the PCB. Button 1 is a 15% preset OC, button 2 is 23% OC and button 3 is user-defined overclock. The fourth button has a “home” image on it and it clears the CMOS. It is very nice to see a new player entering the enthusiast motherboard market, especially by a company well-known for quality and durability. Only time will tell if this experiment will prove successful for the server board manufacturer or if it will retreat before the likes of ASUS, MSI and Gigabyte. Any idea of the price? It looks anemic but I am not saying that is a bad thing as long as they are seriously undercutting the price of the other entry level boards out there. Like $80 otherwise I think they are going to have a hard time selling them. thats what i was going to mention was the price, its it gonna cost a billion dollars or what lol. I like it, that looks promising. Keep in mind that you don't need epic VRM bits for Z87. All the 24 phase, 32 phase, 16 phase, etc. boards are pure marketing Waste of Money (WoM!). Price hasn't been announced yet and I did not find the board in retail. It is a quite a plain looking board when compared to other brands we're used to, with their huge heatsinks and plastic covers 'n stuff. Plain should make it affordable, but at the same time Supermicro usually produces server boards which are much more expensive than consumer boards. We shall see when it hits the e-shelves. Looks like a 70 to 80 dollar mobo.